“Gunpowder” – A lecture and demonstration for local schools & colleges who were involved in a project the clear the Dartford Powder Mill site for public and historic access. “What is an Explosive?” – An introduction to explosives, with a bias towards WWII era munitions including picric acid and picrites for a Japanese delegation at Chemical & Biological Defence Establishment Porton Down. “Shaped Charges” – A lecture about the shaped charge phenomenon its application and effects for; the European Dredging Association, Off Shore Engineering Society, on the Pyrolabs inc.1997 &1998 Pyrotechnic Chemistry courses and as a module on the Institute of Explosive Engineers’ “Science of High Explosives, Legal, Safety & Environmental Concerns” course. 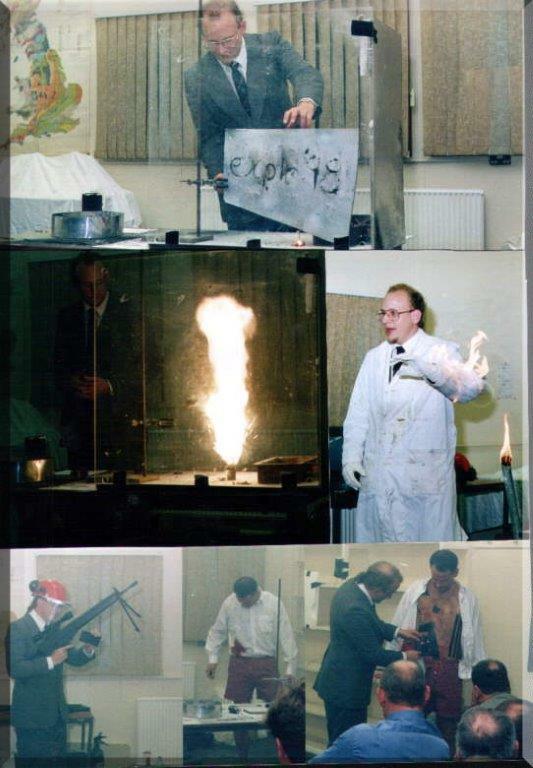 “Exploding The Illusion” – A special effects lectures and demonstrations at; ‘LLAP1’ (a Star Trek Convention), ‘Stow Con Trent’ (role-playing convention), ‘EXPLO 98’ (explosives symposium), Midland / SE / SCW Branches of the Institute of Explosives Engineers, ‘Explo-World 2001’ (a 4 day international explosives conference), The Ordnance Conference (a black powder cannon users conference)and the Health & Safety Executive (as an after dinner speaker/demonstration for two of their conferences). “Explosive Testing of PPE” – Testing of protective gloves, goggles, face and bench shields, the presentation includes numerous high speed videos of the tests showing the explosions, flight of fragments and their impacts with the PPE. Presented at the 2013 Ordnance, Munitions and Explosives Symposium. “Walls Came Tumbling Down” – Presentation looking at the different explosives technologies used in the planning and execution of a complex large scale model demolition for ‘The Fall’ feature film.